The dental clinic is part of a larger, nearly $7 million campaign to expand Bread for the City. 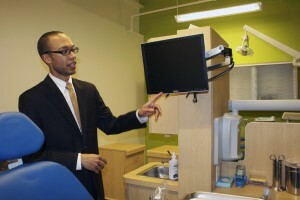 A new medical clinic opened in late 2010 and the dental clinic is housed in one of its spare rooms. The cost to start the clinic and run it for a year comes to about $280,000, which came from a BlueCross BlueShield grant and private donations. “There is a close relationship between dental health and overall health,” Abramson said. Problems can be serious, such as the untreated infection that caused the death of 12-year-old Prince George’s County boy in 2007. They can be minor as well; bad teeth can make it too difficult to eat fresh fruits and vegetables, contributing to other health issues over a long period of time. “But then there’s this whole self-esteem issue,” Abramson added. Some people don’t want to smile, or feel ashamed of their teeth. That can even make it difficult to job hunt for those who feel self conscious about their appearance. Huge Rooftop Vegetable Garden Coming to D.C.